(Courtesy of Hale Centre Theatre) Artist rendering of the Hale Centre Theatre,. (Courtesy of Hale Centre Theatre) Artist rendering of the Hale Centre Theatre. (Courtesy of Hale Centre Theatre) Artist rendering of the Hale Centre Theatre. (Courtesy of Hale Centre Theatre) Artist rendering of the Hale Centre Theatre. (Courtesy of Hale Centre Theatre) Artist rendering of the Hale Centre Theatre. (Courtesy of Hale Centre Theatre) Artist rendering of the Hale Centre Theatre. (Leah Hogsten | The Salt Lake Tribune) Members of the media preview the Hale Centre Theatre's dressing rooms on Aug. 9 . The Mountain American Performing Arts Centre will be the new 130,000-square-foot home to Hale Centre Theatre. (Leah Hogsten | The Salt Lake Tribune) Hale Centre Theatre CEO Mark Dietlein gives details about the theater's stage automation and components that raise, lower, rotate and slide along with custom flying systems located high above the Centre Stage floor. (Leah Hogsten | The Salt Lake Tribune) The green room or hospitality kitchen of the new performing arts center. (Leah Hogsten | The Salt Lake Tribune) Sandy City Mayor Tom Dolan laughs as Hale Centre Theatre Vice President Sally Dietlein (center) hugs him and Sandy City communications director Nicole Martin (left) on the ttheater's construction site on Aug. 9. (Leah Hogsten | The Salt Lake Tribune) Sandy City communications director Nicole Martin (left) and Sandy City Mayor Tom Dolan laugh as Hale Centre Theatre Vice President Sally Dietlein hugs them on the theater's construction site Aug. 9. (Leah Hogsten | The Salt Lake Tribune) Hale Centre Theatre CEO Mark Dietlein, left, and architect Lyle Beecher with Beecher Walker and Associates give details of the state-of-the-art facility to members of the media on Aug. 9. 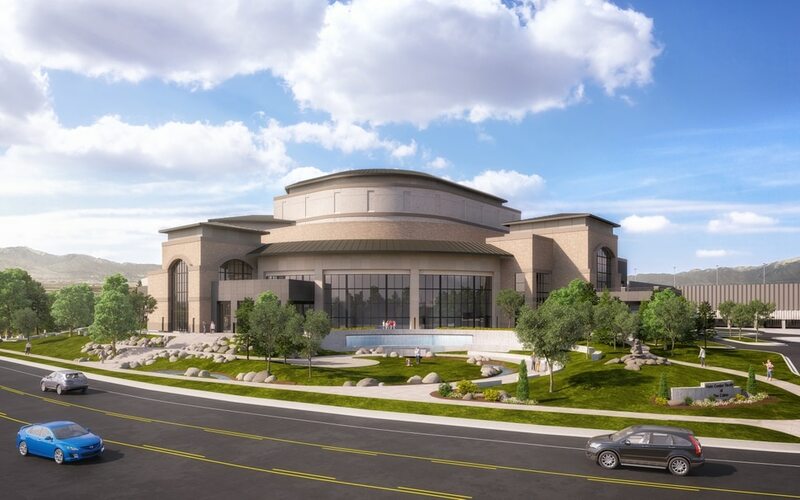 (Leah Hogsten | The Salt Lake Tribune) The Mountain American Performing Arts Centre is the new 130,000-square-foot home in Sandy to Hale Centre Theatre. Hale Centre Theatre will house a one-of-a-kind stage, designed by TAIT Towers, based on hydraulic technology from rock concert tours and Cirque theaters in Las Vegas. (Leah Hogsten | The Salt Lake Tribune) Hale Centre Theatre CEO Mark Dietlein, left, and architect Lyle Beecher with Beecher Walker and Associates give details of the state-of-the-art facility to members of the media on Aug. 9. (Leah Hogsten | The Salt Lake Tribune) Hale Centre Theatre architects demonstrate the hydraulics of the new one-of-a-kind stage, designed by TAIT Towers, based on technology from rock concert tours and Cirque theaters in Las Vegas. 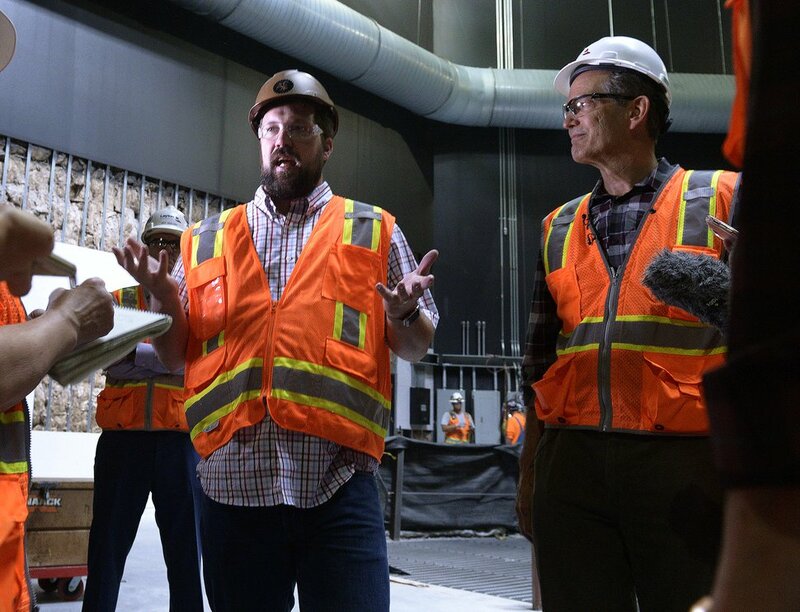 (Leah Hogsten | The Salt Lake Tribune) Electricians laid hundreds of miles of electrical wiring throughout the new Mountain American Performing Arts Centre in Sandy. (Leah Hogsten | The Salt Lake Tribune) Sandy City Mayor Tom Dolan watches a demonstration of the hydraulics of the new one-of-a-kind Hale Centre Theatre stage,. (Leah Hogsten | The Salt Lake Tribune) Hale Centre Theatre stage automation and components that raise, lower, rotate and slide along with custom flying systems located high above the Centre Stage floor. (Leah Hogsten | The Salt Lake Tribune) Patrons will enjoy a large park in front of the new Hale Centre Theatre, complete with fountains, provided by Sandy city. (Leah Hogsten | The Salt Lake Tribune) Patrons will enjoy a large park in front of the new Hale Centre Theatre, complete with fountains, provided by Sandy city. (Leah Hogsten | The Salt Lake Tribune) Hale Centre Theatre CEO Mark Dietlein gives details about the theater's horseshoe-shaped Jewel Box stage that will comfortably seat 467 patrons. (Leah Hogsten | The Salt Lake Tribune) Hale Centre Theatre Production Designer Kacey Udy gives details about the stage automation and components that raise, lower, rotate and slide along with custom flying systems located high above the Centre Stage floor. (Leah Hogsten | The Salt Lake Tribune) Hale Centre Theatre architects give details about the stage automation and components that raise, lower, rotate and slide along with custom flying systems located high above Hale's Centre Stage floor. (Leah Hogsten | The Salt Lake Tribune) Hale Centre Theatre Vice President Sally Dietlein and CEO Mark Dietlein give details about the horseshoe-shaped Jewel Box stage that will comfortably seat 467 patrons. (Leah Hogsten | The Salt Lake Tribune) The Mountain American Performing Arts Centre is the new 130,000-square-foot home to Hale Centre Theatre.. The Sandy complex will feature two state-of-the-art stages: a Centre Stage that will seat 900 patrons and a horseshoe-shaped Jewel Box stage that will comfortably seat 467 patrons, for a total of 1,367 seats. 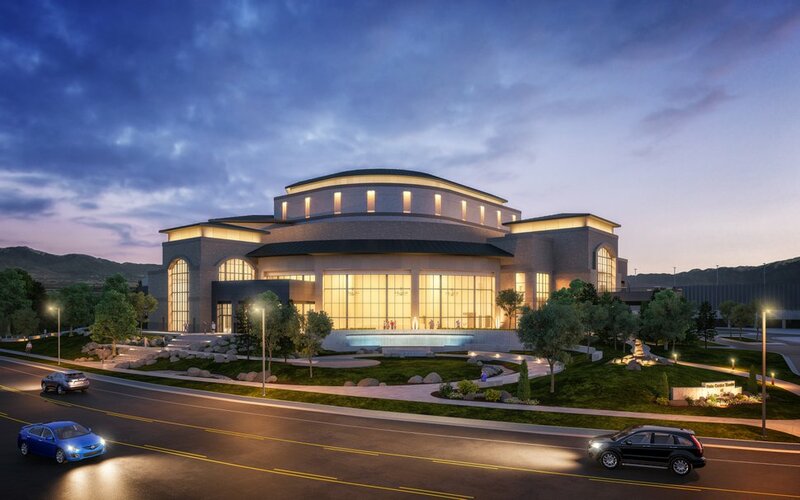 (Leah Hogsten | The Salt Lake Tribune) The Mountain American Performing Arts Centre in Sandy will feature two state-of-the-art stages: a Centre Stage that will seat 900 patrons and a horseshoe-shaped Jewel Box stage that will comfortably seat 467 patrons, for a total of 1,367 seats. (Leah Hogsten | The Salt Lake Tribune) The Mountain American Performing Arts Centre is the new 130,000 square feet home to new Hale Centre Theatre, August 8, 2017. 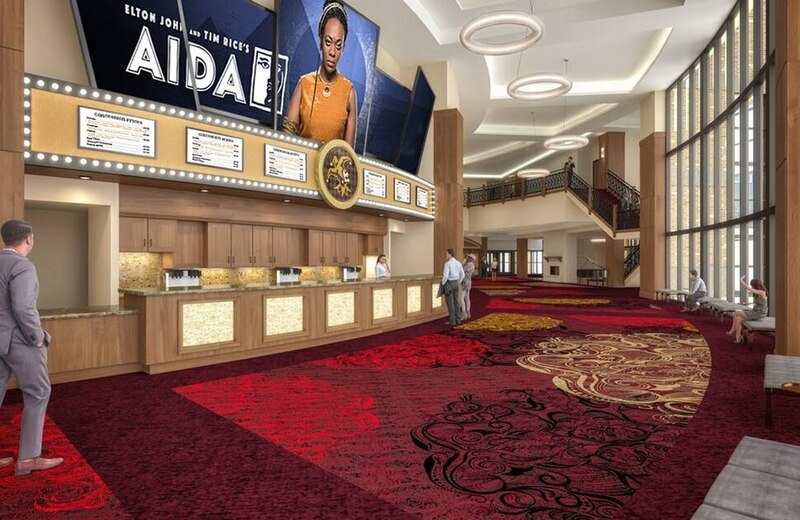 The Sandy city theatre will feature two state-of-the-art stages: a Centre Stage that will seat 900 patrons and a horseshoe-shaped Jewel Box stage that will comfortably seat 467 patrons, for a total of 1,367 seats. (Leah Hogsten | The Salt Lake Tribune) The Mountain American Performing Arts Centre is the new 130,000-square-foot home to Hale Centre Theatre.. The Sandy complex will feature two state-of-the-art stages: a Centre Stage that will seat 900 patrons and a horseshoe-shaped Jewel Box stage that will comfortably seat 467 patrons, for a total of 1,367 seats. (Leah Hogsten | The Salt Lake Tribune) The Mountain American Performing Arts Centre is the new 130,000-square-foot home to Hale Centre Theatre.. The Sandy complex will feature two state-of-the-art stages: a Centre Stage that will seat 900 patrons and a horseshoe-shaped Jewel Box stage that will comfortably seat 467 patrons, for a total of 1,367 seats. (Leah Hogsten | The Salt Lake Tribune) The Mountain American Performing Arts Centre is the new 130,000-square-foot home to Hale Centre Theatre.. The Sandy complex will feature two state-of-the-art stages: a Centre Stage that will seat 900 patrons and a horseshoe-shaped Jewel Box stage that will comfortably seat 467 patrons, for a total of 1,367 seats. (Leah Hogsten | The Salt Lake Tribune) The Mountain American Performing Arts Centre is the new 130,000-square-foot home to Hale Centre Theatre.. The Sandy complex will feature two state-of-the-art stages: a Centre Stage that will seat 900 patrons and a horseshoe-shaped Jewel Box stage that will comfortably seat 467 patrons, for a total of 1,367 seats. (Leah Hogsten | The Salt Lake Tribune) Hale Centre Theatre Production Designer Kacey Udy, left, and CEO Mark Dietlein gives details about the stage automation and components that raise, lower, rotate and slide along with custom flying systems located high above the Centre Stage floor. 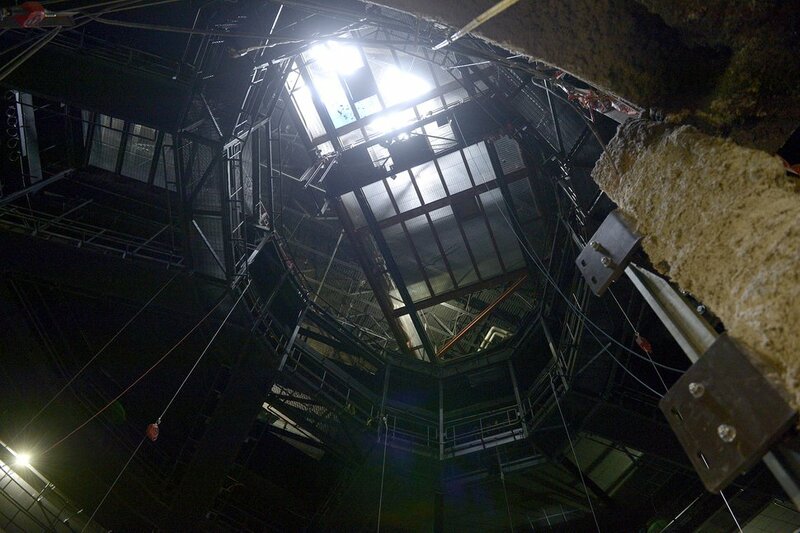 Sandy • The circular lifts of Hale Centre Theatre’s new stage fit together like the components of a giant Erector Set, officials said as they showed off the technology baked into a new Sandy arts complex on Wednesday. It was an emotional demonstration for the company’s co-founders, Sally and Mark Dietlein, as they watched the first working demonstration of the lifts in the new Centre Stage Theatre. The Mountain America Performing Arts Complex will open in parts, beginning Sept. 1 with the run of the popular “Forever Plaid” musical revue on the company’s new thrust stage. It will be like a platter serving up a feast of theater, Sally Dietlein says of the Jewel Box, which will seat 475 people. The rest of the building, as well as the company’s new-generation arena stage, will open Nov. 16 with the run of the Elton John and Tim Rice musical “Aida.” The Centre Stage Theatre, which seats 900, incorporates technology designed for custom-built theaters, such as Las Vegas Cirque du Soleil shows and the Metropolitan Opera, says Kacey Udy, HCT’s production designer. 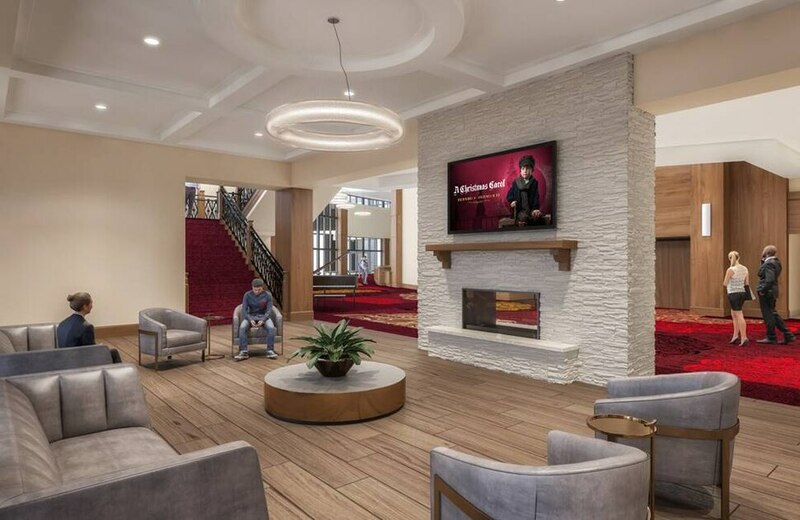 The Sandy theater is the third new arts complex to open over the past 18 months in the state’s unprecedented building boom, after the launch of Cedar City’s two new Utah Shakespeare Festival theaters and downtown Salt Lake City’s Eccles Theater. For the Sandy complex, the theaters and supporting technology systems cost $80 million, while the plaza, fountain and adjacent parking garage cost an additional $20 million. The 14-foot fountain, one of the largest in Utah, will circulate 5,700 gallons of water per minute, said architect Lyle Beecher of Beecher Walker & Associates. (Courtesy of Hale Centre Theatre.) Artist rendering of the Hale Centre Theatre. Mountain America Credit Union donated some $10 million for naming rights, including cash contributions, a $1 million marquee facing the freeway and an additional floor for the parking structure, Mark Dietlein says. Sandy City Council approved $42 million in bonds to help fund the theater, which will eventually be owned by the theater company in a 27-year lease-to-own agreement, says Mayor Tom Dolan. The bells and whistles of the theaters’ backstage systems were designed over eight years, drawing upon staging experience at the company’s West Valley City theater. Then automated systems were added to increase flexibility. “It’s quite magical what they’ve come up with,” says Udy of working with TAIT designers and engineers. (Leah Hogsten | The Salt Lake Tribune) l-r Hale Centre Theatre Production Designer Kacey Udy and CEO Mark Dietlein gives details about the theatre's stage automation and components that raise, lower, rotate and slide along with custom flying systems located high above the Centre Stage floor, August 8, 2017. The house of the Centre Stage Theatre is an oval, intersected by an X, which creates four entrances for actors. The stage is a 24-foot circle, significantly larger than the theater‘s current 18-foot circular stage, which features a circular ring in the middle. The new stage is entirely automated, with a main lift in the middle and two crescent-shaped side lifts. The entire stage can be lowered down into the pit. Then two cantilevered slip stages, which weigh 20 tons, can close over it to create a new stage, which will allow for lightning-quick scene changes. Also new is the theater’s overhead fly space, where two “bogie” carriages, which function similarly to upside-down freight cars, can move sets. (Leah Hogsten | The Salt Lake Tribune) l-r Hale Centre Theatre stage automation and components that raise, lower, rotate and slide along with custom flying systems located high above the Centre Stage floor, August 8, 2017. Having two theaters will increase HCT’s capacity from 613 to 1,360. It means performances will continue throughout the year (except Sundays), rather than closing for two weeks between runs. The company hopes to double its annual audience from 250,000 to 500,000. This month, season ticket sales have increased 40 percent over sales last August, Sally Dietlein says. Beginning Sept. 1, Hale Centre Theater will perform in the Mountain America Performing Arts Center, 9900 Monroe St., Sandy. For show information or tickets, visit hct.org or call 801-984-9000. The last show in the West Valley City theater will be Nathan and Ruth Hale’s comedy “A Bundle of Trouble,” which will run Oct. 21-Nov. 30. Childhood cancer survivors kept showing up in Utah emergency rooms unable to breathe. Researchers have now figured out what’s going on.